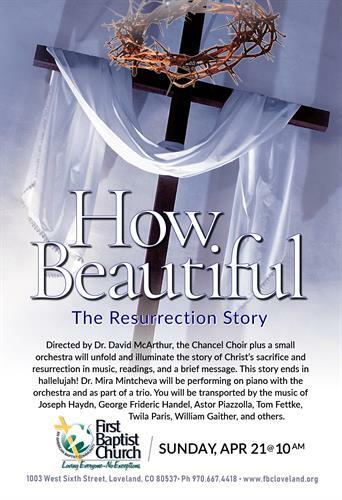 This powerful and moving production is under the direction of Dr. David McArthur, the Chancel Choir plus a small orchestra will unfold and illuminate the story of Christ's sacrifice and resurection in music, readings, and a brief message. This story ends in hallelujah! Dr. Mira Mintcheva will be performing on piano with the orchestra and as part of a trio. You will be transported by the music of Joseph Haydn, George Frideric Handel, Astor Piazzolla, Tom Fettke, Twila Paris, William Gaither, and others.